So I’m out in the car, taking care of a couple of errands. I’m listening to a Christmas CD that I picked up a couple of weeks ago. It’s from a soul/R&B act that was big in the ’70s. I like this group. But this is dreadful. I wouldn’t be surprised if this is a mid- to late ’70s TV special pressed to CD. So I eject it and flip on the radio. Our local dinosaur hard rock station immediately treats me — if that’s the correct phrase — to two live versions of Adam Sandler’s “Hanukkah Song.” I’m not much for holiday novelty music, and I’ve heard this before, but it’s OK. The next cut is Van Halen’s “Ain’t Talkin’ Bout Love.” So much for the holiday music. But I started thinking … what if Van Halen cut a Christmas record? What would that sound like? 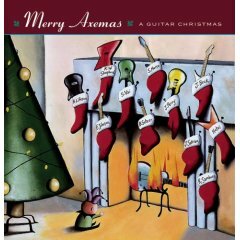 “Do You Hear What I Hear,” Steve Stevens, from “Merry Axemas, Volume 2: More Guitars for Christmas,” 1998. On which Billy Idol’s guitarist turns in a lovely, gentle performance in the first 2:42. After that, it turns into a hard-driving bit of jazz/rock fusion. I like the first part of this instrumental just fine; the second part not so much. As always, you be the judge. “Happy Xmas (War Is Over),” Tomoyasu Hotei, from “Merry Axemas: A Guitar Christmas,” 1997. The Japanese guitarist and composer teams up with percussionist Junji Ikehata for a spirited instrumental cover of the familiar John Lennon/Yoko Ono song. Vai was the executive producer on these all-star guitar compilations, both of which are out of print but available digitally. Among the other guitarists on these CDs (or, to be honest, the ones I liked enough to rip): Alex Lifeson, Eric Johnson, Jeff Beck, Steve Morse and Ted Nugent. Quite a mixed bag.